In the summer of 2004, I made my first trip to Sweden. I played golf courses that were different from the ones in South Florida. They looked as if the wind, snow and ice carved the golf course thousands of years ago. The modern course designer just put the greens in the obvious place. Sweden has the second largest golf community in Europe. 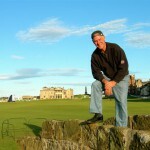 Yet, the country is unknown to most golf travelers. The goal of Swedish Golf Online is to show Sweden as a golf destination that you should come to and experience. Our intent is to show the Swedish course for a visitor’s point of view. In turn, we will reflect on the world of golf with a Swedish point of view. We invite you to let golfers know about playing golf in Sweden. If you have stories about golf and travel in Sweden we welcome your input. Gene moved to Sweden in 2005. He always talked about the wonderful Swedish golf courses and what a shame the rest of golf, especially in the USA, is unaware of this part of the golfing world. At the urging of Eva, his better half, Gene wrote the text for the book, “The Swedish Golf Experience”. Since then, he writes for Swedish golf periodicals and provides text in English for Swedish golf clubs and other Swedish company websites. Gene lives in Stockholm with Eva.